Fire sprinkler systems are some of the best ways to ensure fire safety in commercial facilities. Fire sprinkler systems are some of the best ways to ensure fire safety in commercial facilities. At the first sign of a fire emergency, they are immediately activated to extinguish the flames before they can spread and cause major damage or injuries to people. Not all fire sprinklers operate in the same way or serve the same purpose. Keep reading to learn more about these four types of fire sprinkler systems. The piping systems of the wet pipe fire sprinkler contain water that is discharged as soon as the sprinkler heads are activated. This system is connected to a water supply that feeds directly into the pipes. The heat activates the sprinkler heads from a fire. Dry pipe fire sprinkler systems are attached to a network of pipes that contain pressurized air or nitrogen. When the sprinkler heads are activated by heat, that allows water pressure to open the dry pipe valve. Once the dry pipe valve has been opened, water will then flow through the pipes and out of the sprinkler heads. This sprinkler systems type is the most appropriate in settings that experience freezing temperatures on a regular basis. 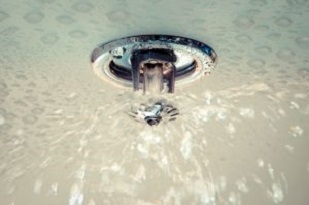 The characteristic unique to the pre-action fire sprinkler system is that the sprinklers are closed and work with a separate detection system. The pre-action sprinkler system is used primarily in settings that include items of high value like museums, government facilities, libraries, and other similar locations. Once the separate fire detection system is activated water will then be released into the piping system. Pre-action also requires that heat activates the operating elements in each sprinkler before the water will flow. The foam-water sprinkler system involves pipes that are connected to a source of foam concentrate as well as a water supply. Upon activation, foam concentrate is injected into the water as it is discharged which creates a foam solution. This system can operate as wet pipe, dry pipe, or pre-action. This entry was posted on Wednesday, August 8th, 2018 at 8:43 am. Both comments and pings are currently closed.